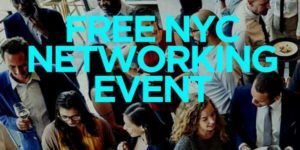 Whether you are an entrepreneur, small business owner or business professional, this event is the perfect opportunity to get away from your desk, have some cocktails and network with potential business partners, investors, industry professionals and new clients…. Or just come on out and make some new friends! We’ve witnessed countless business connections and friendships form at our past events. * WE WILL SEND YOU THE EXCLUSIVE VENUE LOCATION AFTER YOU SIGN UP. Admission is free of charge and there are no speakers or sales pitches, just a great night connecting with real people. Bring your business cards, make new friends, meet your next business connection or simply mingle with accomplished individuals. Yes, there’s a full menu of great drink specials available at the bar. While there’s no official dress code we ask that you don’t wear gym gear or baseball caps. What you wear to work in likely perfectly fine. Single professionals of all sorts and ages. Absolutely. Arrive any time you’d like. The event officially starts at 6:30 but if traveling in from a distance you’re welcome to arrive at 7:30 or after.